Point and click like it's 1999. Goicha Suda—or Suda 51 as he’s otherwise known—is a Japanese developer renowned for making quirky, off-the-wall console-exclusive action games; a list which boasts the likes of Killer 7, No More Heroes and Lollipop Chainsaw. While the slightly disappointing Killer Is Dead did make the jump to PC in 2014—Andy described it as the “very definition of style over substance”—we learned earlier this year that his first game, The Silver Case, is being remastered and will launch on Steam this Autumn/Fall. It's now got a free demo. 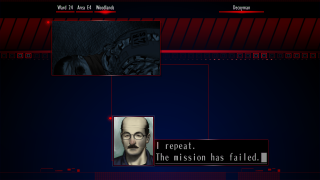 Released only in Japan on PlayStation consoles towards the end of 1999, Suda 51’s The Silver Case is a text-based point and click adventure-meets-visual novel where much of its narrative unfolds via early Metal Gear Solid Codec-esque dialogue. You might fare a little better, but The Silver Case instantly feels like a Suda game. From the opening chapter alone, it's immediately clear which leads the auteur developer took from here—not to mention the ideas he expanded upon in later games. “1999 - the "24 Wards". A string of mysterious serial killings plagues the city. The detectives of the 24 Wards Heinous Crimes Unit have their eyes on one man: Kamui Uehara, legendary serial killer and assassin of a number of government officials 20 years prior in the now-famous "Silver Case". However, nobody knows the true identity of Kamui. As the story unfolds that question will undoubtedly be answered—which is what you’ll have the chance to do in Autumn/Fall of this year. In the meantime, download the demo for free via The Silver Case’s Steam page.